Agio International is recalling its "Garden Treasures" outdoor fireplaces sold at Lowe's stores. Touch-up paint used on the fireplace's exterior can ignite during use, posing a fire hazard. There have been two reports of paint on the fireplace's exterior igniting. No injuries have been reported. 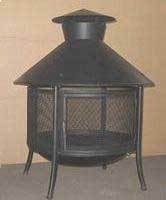 The recalled fireplace consists of a round fire bowl that rests on four legs, with a chimney cap and hood. The fireplace is made of steel and is painted black. They are about 3-feet tall and 2-feet wide. The item number, 91023, is printed on the package materials. The fireplaces were sold at Lowe's stores exclusively nationwide from August 2005 through July 2006 for about $100. Consumers should stop using the fireplaces immediately and return them to any Lowe's store to receive a full refund. Consumer Contact: For more information, contact L G Sourcing at (866) 284-9161 anytime, or visit the Lowe's Home Centers, Inc. Web site at www.lowes.com. Target is recalling about 185,000 Firestreet scooters. The handlebars, wheels and wheel brakes can break and detach, causing the rider to lose control, fall and possibly suffer injuries. Target has received five reports of incidents and injuries resulting from breaking or collapsing parts. Injuries resulting from falls include: a fractured arm, cracked teeth, bruises to the head, face and arm, a report of a lacerated toe, and scratches. This recall involves F Forward Firestreet scooters. The red or blue aluminum scooters have a fold-down frame and model number BZ 020 SP. The ?F Forward? logo is noted on the stem, wheel or base deck of the scooter. The scooters were sold at Target stores nationwide from February 2004 through July 2006 for about $24. Consumers should take these scooters away from children immediately and return the scooter to the nearest Target store for a $24 gift card, plus applicable sales tax. Consumer Contact: : For more information, consumers can contact Target at (800) 440-0680 between 7 a.m. and 6 p.m. CT Monday through Friday, or log on to the firm?s Web site at www.target.com. Black & Decker is expanding its recall of cordless electric lawnmowers. An electrical component in the lawnmowers can overheat, posing a fire hazard. The recall covers about 160,000 mowers, including 140,000 that were recalled in September 2002, but also are included in this recall. Black & Decker has received 10 additional reports of electrical components overheating, including one additional report of a fire extending beyond the mower. The original recall involved 11 reports of electrical components overheating. One of these resulted in a minor hand burn and nine resulted in reports of minor property damage extending beyond the mower. The mowers were sold under both the Black & Decker and Craftsman brand names. The recalled Black & Decker mowers have the model CMM1000 or CMM1000R and are labeled as Type 1 through Type 4, both of which are located on the silver and black label affixed to the rear door of the mower. Mowers labeled as Type 5 are not included in this recall. The Black & Decker mowers have either an orange or green deck with a black motor cover. The Craftsman-brand mowers have model number 900.370520 and include all date codes and types. The model number is located on the silver and black label affixed to the rear door of the mower. The Craftsman mowers have a dark green deck with a black motor cover. The mowers were sold by home center, hardware and discount stores, and authorized Black & Decker dealers nationwide from February 1996 through December 2005 for between $360 and $450. Craftsman-brand mowers were sold at Sears and Orchard Supply Hardware stores nationwide from January 1998 through December 2000 for between $360 and $400. All consumers should stop using the lawnmowers immediately and call for information on receiving a free inspection and repair if necessary. Consumers who had their mowers repaired as a result of the previous recall should have their mowers again inspected and repaired, if necessary, as part of this recall. Consumer Contact: For additional information, consumers with Black & Decker mowers should contact Black & Decker toll-free at (866) 229-5570 between 8 a.m. and 4:30 p.m. ET Monday through Friday, or visit the firm's Web site at www.blackanddecker.com. Consumers with Craftsman-brand lawnmowers should call (888) 375-9741 between 7 a.m. and 9 p.m. CT Monday through Saturday. The National Highway Traffic Safety Administration has ordered the recall of 826,687 Jeep Liberty SUVs because the front suspension may fail and cause a crash. On some Jeep Liberty vehicles, NHTSA reports that the "constant tension front lower ball joints may experience contamination" causing the ball joint to wear prematurely and loosen. Eventually, the NHTSA report concludes, the ball joint could separate causing a loss of steering control and "increasing the risk of a crash." DaimlerChrylser will replace the front lower ball joints free of charge when the recall begins in September. Owners can contact DaimlerChrysler at 1-800-853-1403 or NHTSA at 1-888-327-4236 (TTY 1-800-424-9153). Regulators at the National Highway Traffic Safety Administration are investigating consumer complaints about two popular Toyotas, the Tundra pickup and the Sienna van. The investigations are more bad news for recall plagued Toyota and once again call into question the automakers reputation for quality. NHTSA has upgraded an investigation into reports of excessive wear of a front suspension part in 2003 and 2004 Toyota Tundra pickups and has had opened a separate probe into 2004 and 2005 Toyota Sienna minivans after receiving reports of four injuries that occurred when the liftgates shut unexpectedly. Toyota recalled a million vehicles worldwide in July. After reports of 142 suspension failures in some 2003-2005 Toyota Tundra pickups, NHTSA upgraded the investigation of the trucks lower ball joints to an engineering analysis and that could lead to an expanded recall for the trucks. This is the second investigation of Toyota trucks for ball joint failures in just a year. Toyota recalled certain models of the 2001 through 2004 Tundra, Sequoia, Tacoma and 4Runner on May 16, 2005 because of the potential for the lower ball joint to separate. The 2005 recall involved approximately 775,000 trucks and SUVs during a time frame when the assembly process might have produced scratches on the ball surface causing premature wear. Toyota replaced the lower ball joints in the recalled vehicles but now NHTSA is investigating consumer reports of ball joint failures in Toyota Tundras that were not part of the 2005 recall. The latest NHTSA investigation involves as many as 219,522 Tundras that were not covered by last year's recall. NHTSA has received 4 consumer complaints of incidents where the lower ball joint in a Tundra separated while driving and the suspension collapsed causing loss of vehicle control. The 142 trucks experiencing the suspension failure had an average mileage of 54,782. There are 83 reported suspension failures in 4 wheel drive Tundras and 59 in 2 wheel drive trucks. None of the Toyota trucks with collapsed suspensions were part of the 2005 recall. NHTSA has received 8 complaints with 4 reported injuries after the liftgate on the Sienna inadvertently closed during normal use and hit the complainant on the head or body. The investigation covers 393,313 vehicles. Toyota told dealers in March 2004 it was redesigning minivans' liftgate struts from that model year to prevent damage to a seal. Six of the latest complaints were for 2004 models, and two were for the 2005 version. The National Highway Traffic Safety Administration has recalled 1,190,000 Honda and Acura vehicles as well as several Honda motorcycle models. "The language in the owner's manual is not in accordance with the current mandatory requirements," the agency said. In all, 46 Honda models are involved in the NHTSA recall because the owner's manual contains incorrect information for NHTSA's vehicle safety hotline. NHTSA is requiring Honda to send a postcard to dealers and owners with the correct hotline information. Included with the postcard are instructions from NHTSA to "insert the card into the 'reporting safety defects' section of the vehicle owner's manual."